Today is Tallulah’s 2nd Birthday! 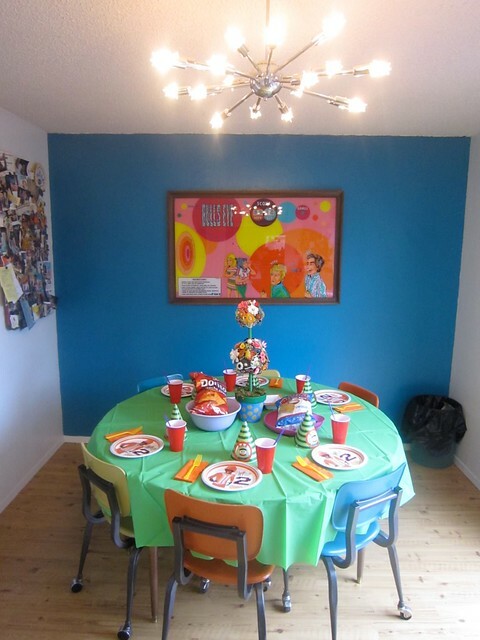 It took everything in my power not to throw a party (check out part 1 and 2 of last year’s festivities). With the baby being due in a week, I thought better of it. 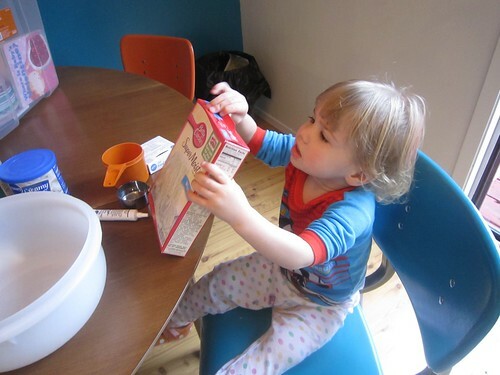 I couldn’t let the day pass without doing anything so Tallulah and I decided to bake a birthday cake. 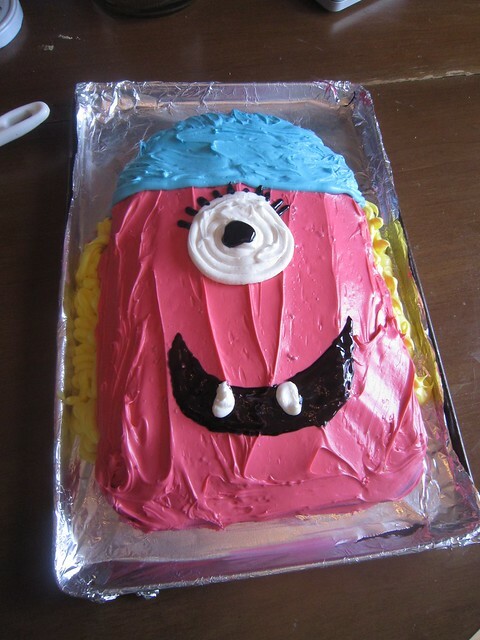 My original plan was to make a Muno cake since I had bought a party pack with a Yo Gabba Gabba theme. After I could not make red icing and Tallulah’s recent obvious obsession with sisters I opted to make the cake Muno’s sister Chibo instead. 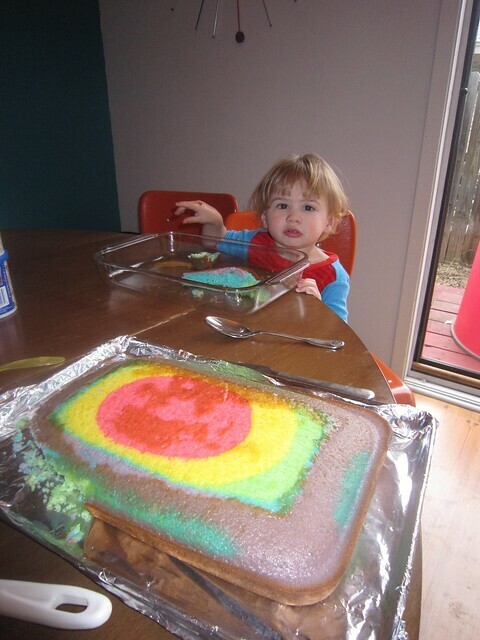 Not only did we fix up the outside of the cake, we made the inside rainbow-rific as well. 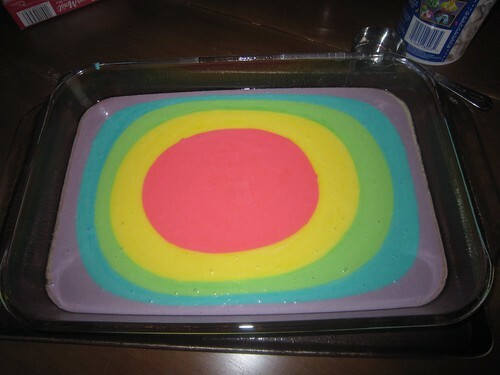 I have seen lot’s of people make rainbow cupcakes and round rainbow cakes, I thought couldn’t I do the same thing with a sheet cake that I could carve? I was right. 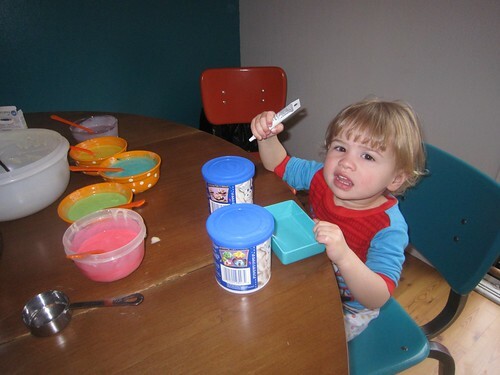 Mix a white cake mix according to directions and then split the batter between as many small bowls as you want to have colors in your cake. I used food coloring gel, apparently if you use fancy food coloring from the baking store your colors will be more vibrant. The lighter colors matched Chibo so it worked out fine for me. Pour the batter into the center of the well greased pan one bowl at a time. I poured the next color directly into the center of the last one until all the batter was in the pan. Bake according to directions. Once the cake cooled I carved the top so that it was rounded. I iced the cake to look like Chibo using a few of the skills I learned in cupcake decorating class. Tallulah supervised and made sure I got all the icing out of the jar. All our hard work was worth it because Tallulah has talked non-stop about her “sister cake”. All that was left to do was set the table and cut the cake. Tallulah was more interested in eating ice cream than she was the cake, but the rest of the fam enjoyed it! 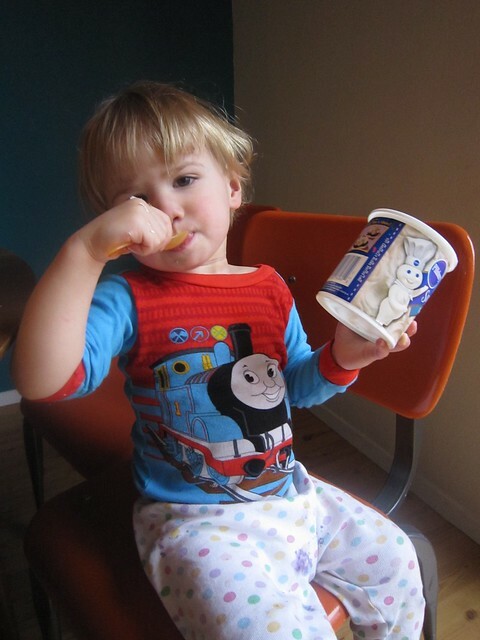 Posted February 22, 2011 & filed under Foodie, Kids, Parties, recipes. Happy Birthday Miss Tallulah. Good job mom. My Holly turns four today. February 22 a very good day indeed. Wow, Jennifer Tallulah's birthday cake is sooo cool! It looks like y'all had fun together. Happy Birthday! My son's 2nd birthday is the 24th. He loves YGG too. Its also the 2nd anniversary of me following your blog..I found it while I was on my maternity leave. Good Luck with the birth of your new addition. Im sure T will be a great big sis! 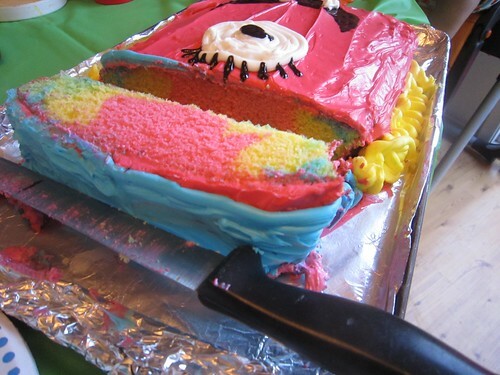 I made a Neapolitan cake for my son one year and it was oh so good! Eugina tell holly happy birthday! Kelly what is a neapolitan cake? Sounds yummy. I wanna try an ice cream cake or baked alaska next! Donna we did have fun. T got her own play kitchen for christmas so she is really into cooking. tallulah is getting so big! it's awesome that she and her sibling will have birthdays so close together! hope you're doing well!